There are 2 vacancies on the community council, as a result of the membership being increased to 18. 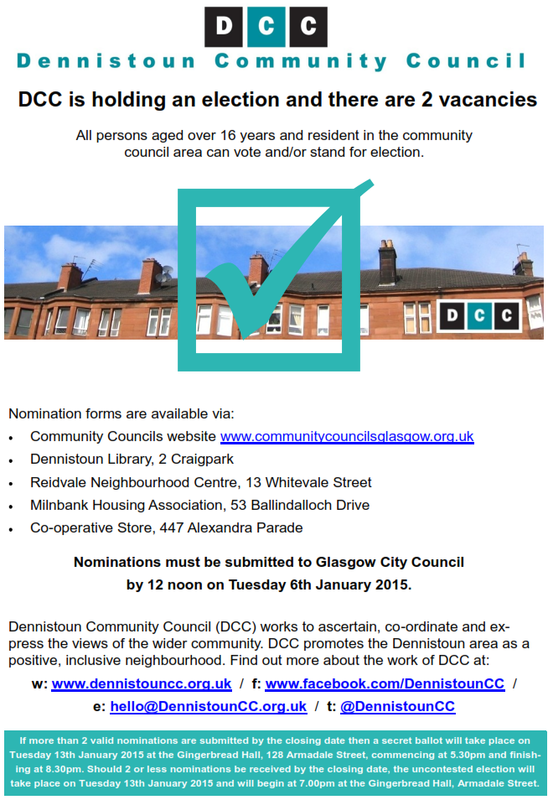 Nomination forms can be downloaded via this link (for the PDF) or, alternatively, hard copies will be available from from our designated sites: Dennistoun Library, Reidvale HA, Milnbank HA. The deadline for submissions of completed forms is Tuesday 6th January 2015. All persons aged over 16 years, resident in the Dennistoun Community Council area and on the electoral register or a supplementary list are entitled to stand, be a proposer and be a seconder in community council elections. If one or two eligible submissions are recieved, the proposals will be automatically appointed. If more than two submissions are recieved, there will be a vote at the next meeting. The meeting where new members will be appointed shall be held on 13th January 2015. Community Councillors have a role to bridge the gap between local authorities and communities and to highlight the opinions, needs and preferences of the communities they represent. Browse around the site to get a feel for what we do, or contact us if you have any questions.